Last month marked the 70th anniversary of the US atomic bombings of Hiroshima and Nagasaki. The hibakusha, the survivors of these bombings, demand nuclear abolition. So do the victims and survivors of the 2000 nuclear tests around the world, who have had their lives changed forever and over generations. This call is supported by the majority of the world’s governments and peoples. Yet the states that wield nuclear weapons continue to do so, just as they continue to pour billions of dollars into the maintenance and modernization of these weapons of terror. These states protest that the reemerging humanitarian and moral discourse and approach to nuclear weapons is a distraction from what they see as the real work of disarmament—yet they refuse to engage in disarmament negotiations themselves. This opposition has been revealing. It reveals a concern that discussions about the unacceptable consequences of nuclear weapons will inevitably lead to their international prohibition. It reveals a concern that the relentless multi-billion dollar modernization of nuclear arsenals is being exposed through international discussions. It reveals a concern that an initiative is emerging and can move forward even without the nuclear-armed states. There is a new sense of empowerment among the peoples and governments of countries that reject nuclear weapons. Three governments have hosted conferences on the humanitarian consequences of nuclear weapons, with attendance rates higher than to NPT meetings. 159 countries have endorsed a joint statement on the humanitarian impact of nuclear weapons which affirms that “it is in the interest of the very survival of humanity that nuclear weapons are never used again, under any circumstances.” And there is a new and growing expectation that negotiations are going to begin in the near term on a legally-binding instrument for the prohibition and elimination of nuclear weapons. The pledge that so far 116 governments have made to fill the legal gap for the prohibition and elimination of nuclear weapons has demonstrated clearly the willingness of states to start work on a new legally-binding instrument. This work must begin now. We cannot afford to wait. 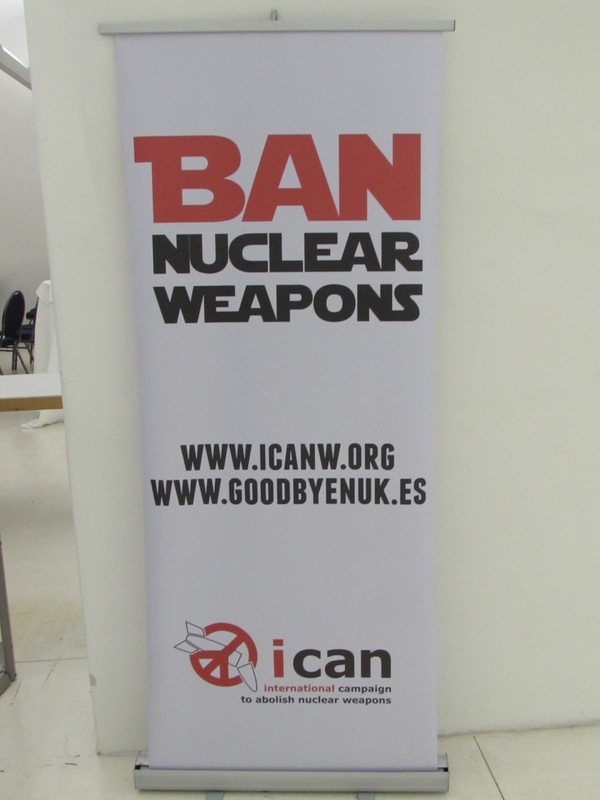 Many governments and civil society groups campaigning for the abolition of nuclear weapons have articulated a treaty banning nuclear weapons as a feasible and realistic option to begin this work. Such a treaty would set an international standard prohibiting all nuclear weapon activities and help us advance toward the verifiable and irreversible elimination of these heinous weapons once and for all. It would help reinforce the norms against nuclear weapon use and possession and through prohibitions on financing would directly impact activities of the nuclear-armed states. A treaty banning nuclear weapons and the process of work to put it in place will not immediately solve all the problems with nuclear weapons. Nor are these efforts meant to replace the work to reduce nuclear arsenals and maintain dialogue among nuclear-armed states on disarmament. All of these efforts must intensify. They are not mutually exclusive, but mutually reinforcing. The nuclear-armed states must eliminate nuclear weapons and the global war system they uphold by taking apart the apparatus of annihilation that has distorted human development immeasurably for generations. Nuclear weapons fundamentally violate the principles of humanitarian law. They are morally intolerable and illegitimate instruments of terror. The nuclear armed states must stop talking about nuclear disarmament as an abstract goal for the future and start acting on past commitments long in abeyance. More than 40 years ago, the nuclear-armed signatories of the NPT agreed in Article VI to negotiate in good faith for “effective measures relating to early cessation of the arms race and to nuclear disarmament.” In 1996, the International Court of Justice unanimously found: “There exists an obligation to pursue in good faith and bring to a conclusion negotiations leading to nuclear disarmament in all its aspects under strict and effective international control.” The parties to the NPT gave further meaning to this language at the 2000 Review Conference by committing to the unequivocal undertaking to eliminate nuclear arsenals, the principle of irreversibility, and the diminishing role of nuclear weapons to facilitate their elimination. This has been reaffirmed at every NPT meeting since then. In order to make these commitments a reality, all nuclear armed states must immediately cease the improvement of existing nuclear weapons and the development and manufacture of new ones. This should include not only bombs and warheads but nuclear-capable delivery systems. All nuclear-armed states also should cease the modernization of laboratories and factories where nuclear weapons research and manufacture are conducted and all other countries should cancel their contracts and investment in such facilities. Such concrete actions would send an unambiguous signal that nuclear weapons do not have a future —something that mere reductions in the numbers of weapons in nuclear arsenals still of civilization-destroying proportions do not provide. Continuing to highlight the humanitarian impacts and the application of international humanitarian law and international human rights law to nuclear weapons strengthens the norms against possession and use, and keeps the essential truth about these weapons—that they are too horrible and destructive to serve any human purpose—firmly in the foreground of disarmament forums and discourse. We encourage everyone seize this day as an opportunity commit to action to prohibit and eliminate nuclear weapons now by beginning a process to negotiate a new legally-binding treaty to ban nuclear weapons and continuing to pressure the nuclear-armed states to comply with their legal obligations on disarmament. ← Can we have a world free of cluster bombs? We are on our way.